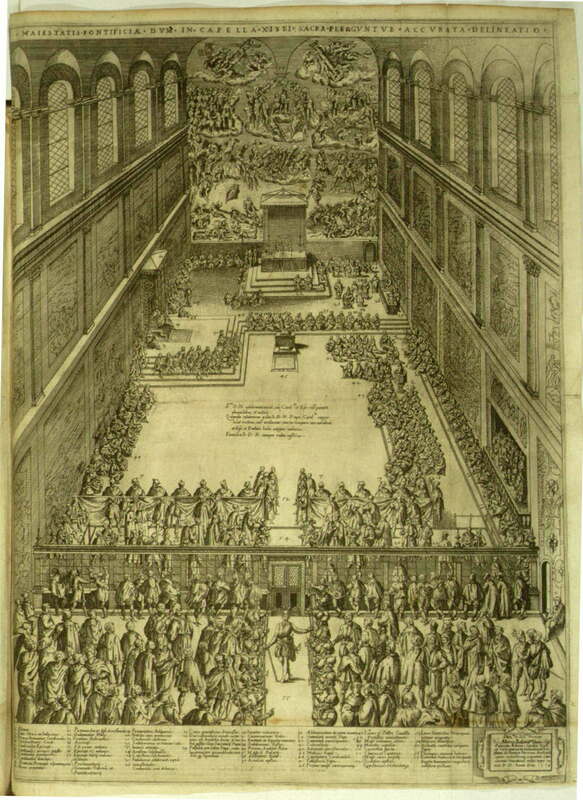 An early engraving of the Sistine Chapel shows the full pomp of a papal religious ceremony, with the pope, the entire papal curia, and the singers in their box (lower right) gathered around a lectern. Every important participant is identified by a number corresponding to a legend at the bottom of the page. The pope on his throne at the left is no. 4, and the papal singers in their "cantoria" are no. 51. The earliest complete extant constitution outlines the singers' duties, privileges, and code of behavior and offers detailed rules for their daily personal and professional life. 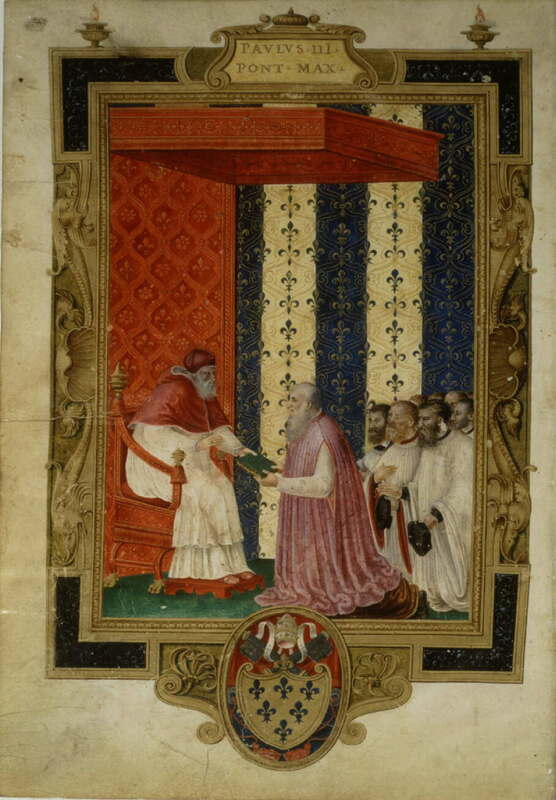 The beautiful illuminated full-page opening miniature portrays the reigning pope Paul III presenting the constitution to the master of the papal chapel, with the singers of the chapel kneeling behind him. Stefano Landi (ca. 1586-1639) was a member of the papal chapel in Rome and also worked for the powerful Barberini family. 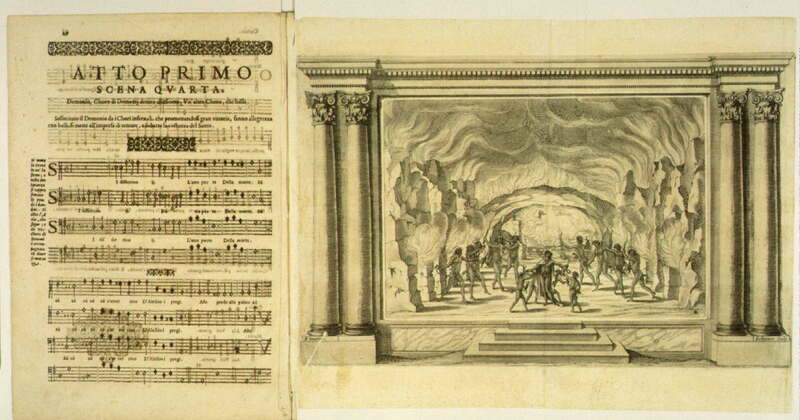 In 1632 his opera "Sant'Alessio," with a libretto by Giulio Rospigliosi (1600-69), later Pope Clement IX, was premiered in the Barberini palace in Rome; the score was published two years later. Although most early operas drew their plots from pagan mythology, this work is based on Christian hagiography--the life of the fifth-century Saint Alexis--yet also contains comic characters and elaborate scenic effects. The woodcut illustration displayed here shows one of those scenes, depicting nothing less than Hell itself. 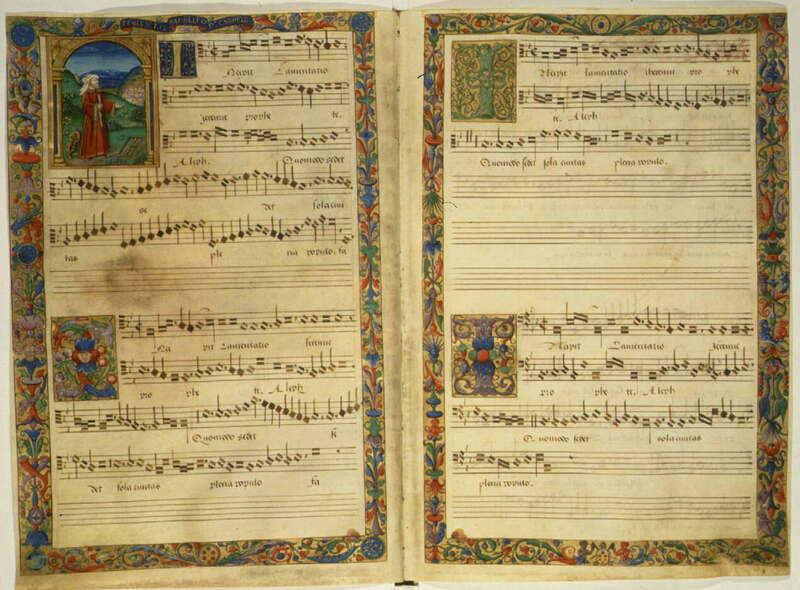 The composer Carpentras was master of the papal chapel during the reign of Pope Leo X and wrote, among other things, polyphonic settings of the Lamentations of Jeremiah--part of the liturgy of Holy Week. Returning to Rome for a visit after Leo's death, he heard performances or saw copies of his "Lamentations" that were so different from what he had originally composed that he decided to present the reigning pope Clement VII (1522-1534) with a decorated parchment manuscript, on display here, containing the "correct" and "authentic" version of his music. This work of Costanzo Festa (ca. 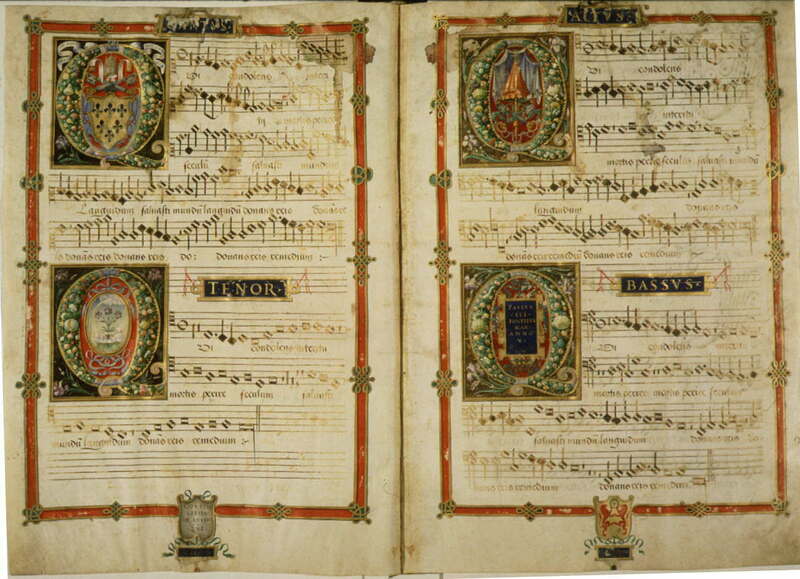 1480-1545), an Italian who served as a singer in the papal choir from 1517 until his death in 1545, is the earliest collection of polyphonic hymns and Magnificats by a single composer in the Sistine fondo. The opening of his hymn "Conditor alme siderum" is shown here, with the arms of the reigning pope Paul III on the elaborately decorated "Q" in the upper left. The coat of arms at the bottom of the right-hand page--lions holding a wreath with a fleur-de- lis--may be the composer's personal coat of arms. Paris de Grassis (ca. 1450-1528) was papal master of ceremonies during the reign of Pope Julius II (1503-13). 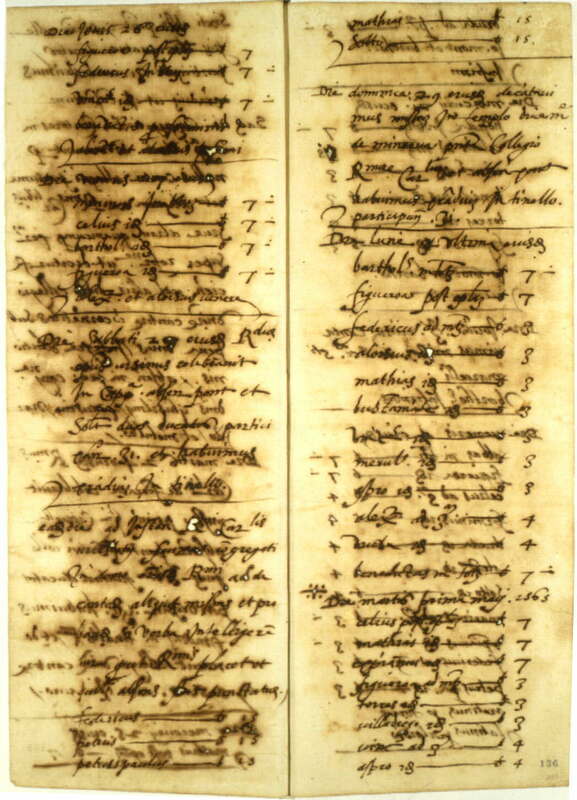 He kept the extensive diary shown here. 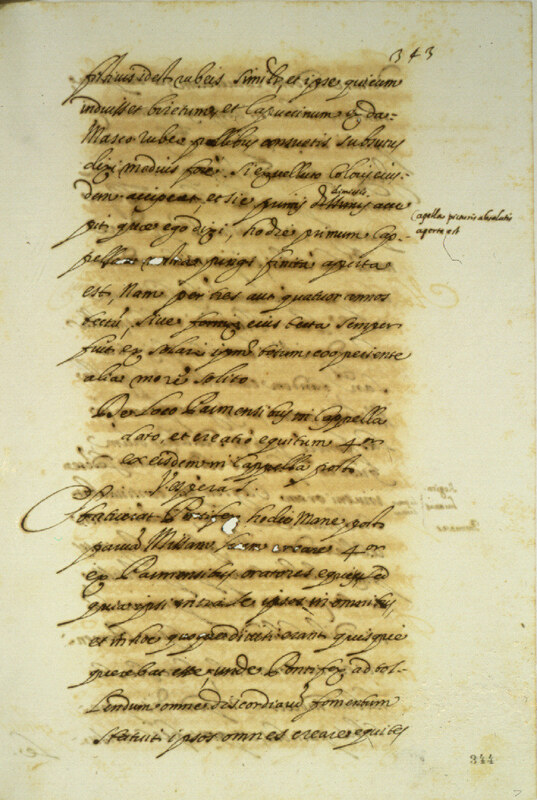 In this entry describing the vespers that took place on 31 October 1512, de Grassis mentions that Michelangelo's newly-painted ceiling in the Sistine Chapel was displayed to the public for the first time. You can continue the exhibit in the next room, or you can turn around and go back to the Music hall. The alternative is to go all the way to the main hall.